Turtle Clean™ 30 External Canister Filter | Zoo Med Laboratories, Inc. External canister filter for 30 gallon turtle tanks, vivariums, Box Turtle pools, or Turtle Tubs. Provides greater aeration with the included spraybar. Formerly the Turtle Clean™ 511. 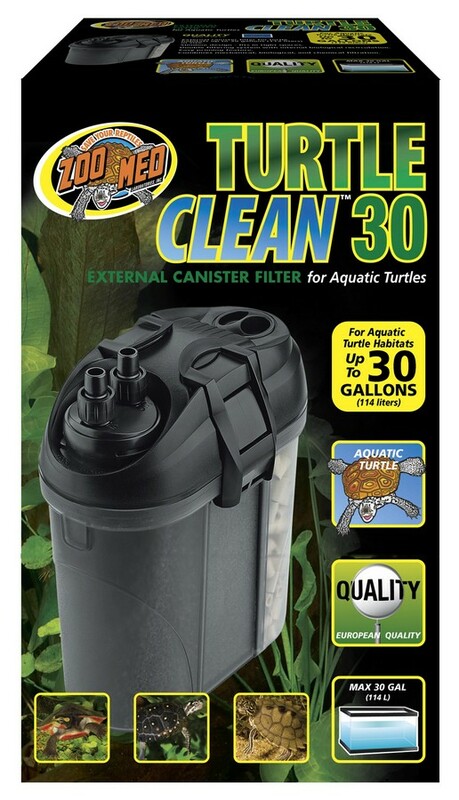 Zoo Med’s Turtle Clean™ 30 is the perfect filtration system for aquatic turtle tanks up to 30 gallons. Here’s Ashley to help you set it up. A: The carbon bag should go below the ceramic media. A: The ceramic media should only be changed if it is restricting water flow. It can be rinsed each month. A: Be sure that the cannister is completely full of water and that the fill cap is in place before plugging the filter in. Q: My filter only came with 3 of the 4 screw nuts it was supposed to. Can I use it with only 3? Can you send me another one? A: All of the little plastic pieces are packaged together in a plastic bag; often the screw nut will fall inside the strainer during shipping. Please check the strainer at the bottom of your intake tube. If you do not find it there, please contact Customer Service. Please note: allowing the screw nut to remain in the strainer may restrict the filter flow in the future. Q: What is the Gallons Per Hour (gph) rating? A: The 2 tubes are 10 7/8″ with a diameter of 1/2″; the 2 hoses are 2′ long with a diameter of 5/8″.